"This recipe is a huge hit at my Christmas parties, but it's great for every occasion. Salty-crispy bacon and sweet pineapple. Yummy!" Place the pineapple in a large bowl, and toss with sweet and sour sauce. Cover, and marinate overnight in the refrigerator. To prevent burning, place toothpicks in a small bowl of water and soak 10 minutes. Place a paper towel over a microwave-safe dish and arrange part of the bacon on the towel; cover with another paper towel. Cook the bacon in a microwave oven on medium just until partially cooked and still pliable, 2 to 3 minutes. Repeat with remaining bacon. Cut bacon strips in half. Preheat oven to 350 degrees F (175 degrees C). Lightly grease a baking sheet and set aside. Wrap half a bacon strip around each pineapple chunk. Secure bacon with a toothpick, and place on baking sheet. Repeat with remaining bacon and pineapple chunks. Bake in preheated oven until bacon is crisp, 20 to 30 minutes. Cool 5 minutes before serving. Creamy, cheesy, spicy bite-size party appetizers. Very popular and highly addictive. Depending on crowd I add 1/2 C of hot sauce to mixture. Also, have found is best to wrap so the fatty end of bacon is on the outside to best render/crisp up. Husband *LOVED* them! I baked some per the recipe, and grilled some. Both ways were wonderful. I do not think that the sweet and sour sauce made much of a diference. Used fresh pineapple. Not a bad recipe great for summer and the grill. My wife tried these for our holiday party. WOW! These were great. 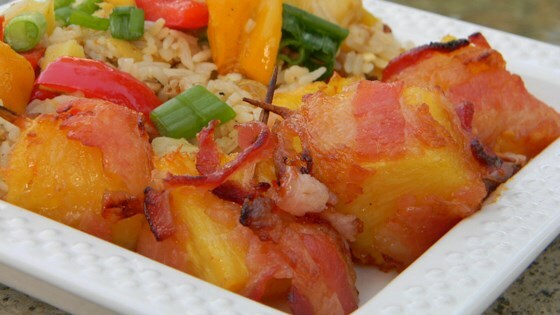 Of course everyone in our family loves bacon...and pineapple, so these were bound to be a hit!